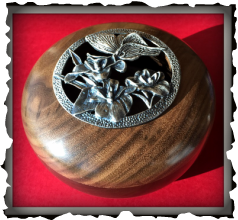 I produce a line of beautiful and unique handmade potpourri bowls with ornate pewter tops. 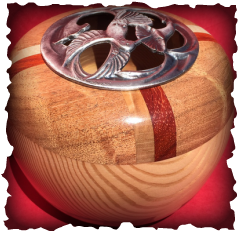 The bowls are hand crafted, shaped, turned, sanded and finely finished with great care, producing one of a kind original pieces of art, no two bowls are alike. Many types of choice woods are used, some are from one type and some from a combination of a variety of woods. 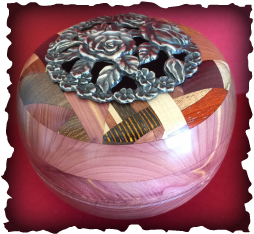 The bowls can be used with dried potpourri or as a stand alone display piece. 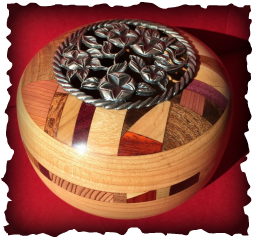 Dimensions are 5-6 inches in diameter and 3-5 inches in height. 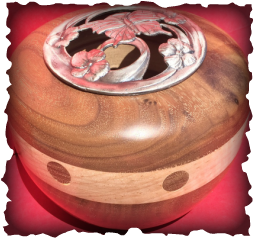 Each bowl is different and represents a variety of woods, shapes, designs and colors.